the upcoming event of 2018 is dedicated to Sicilia, the largest Mediterranean island. Its most prominent landmark is Mount Etna, the tallest active volcano in Europe, and one of the most active in the world, currently 3,329 m (10,922 ft) high. The island has a typical Mediterranean climate. “La voce del corpo” a funny journey into the world of Italian body language between stereotypes, history, culture and superpowers. “La voce del corpo” is a one man show by the Sicilian Luca Vullo and his mother Angela Gabriele (she will be also the person in charge of preparing the gastronomic specialities). The show will be in English with few parts in Italian/Sicilian dialect. 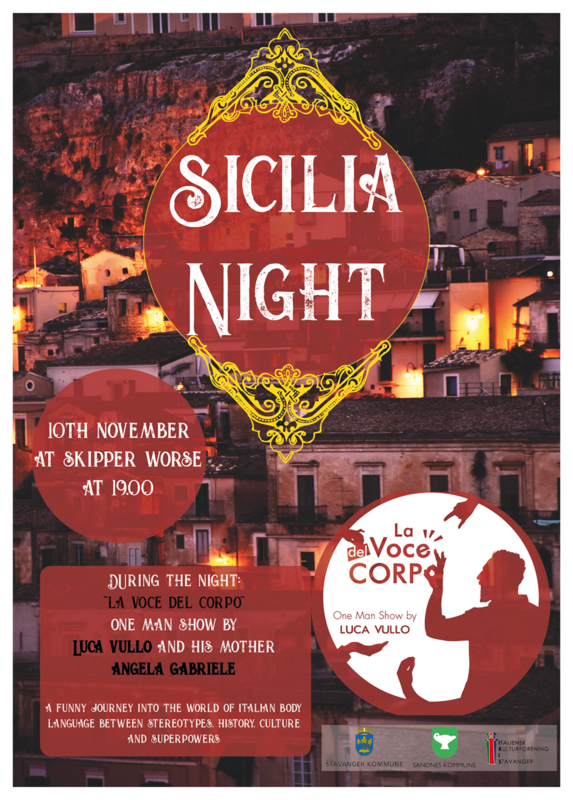 So let's meet at Skipper Worse to enjoy the show, discover some food specialities and wine from this fascinating Italian region. It is mandatory to register in advance and pay the registration fee (via Vipps, PayPal and bank transfer).